October 4, 2016 By Allyson 3 Comments This post may contain affiliate links. Read my disclosure policy. One Pot Cheesy Pesto Tortellini is the easiest and tastiest weeknight meal – tender tortellini and tomatoes drenched in a creamy cheesy pesto sauce! As y’all know, my life is BUSY! I love coming up with QUICK and EASY meals that we can enjoy as a family because who has hours to slave over the stove? Not me, and you shouldn’t either. 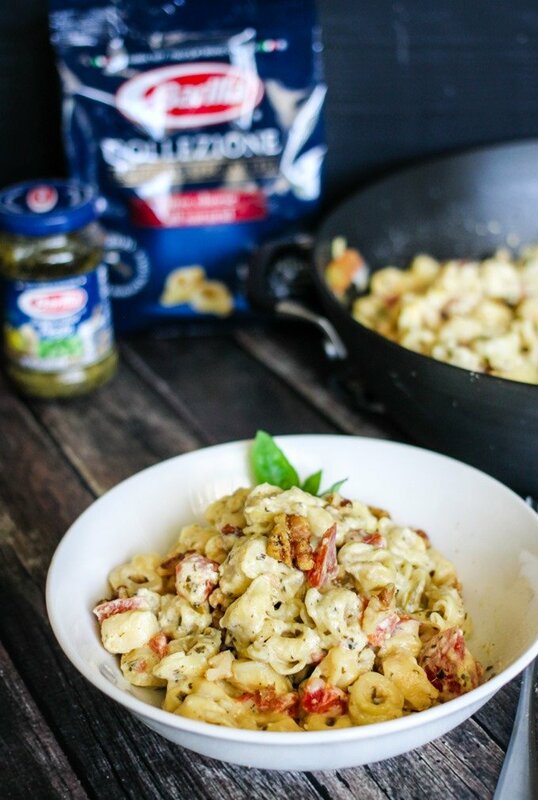 That’s why when I saw these Barilla Collezione Tortellini at BJ’s Wholesale Club the other day, I knew I could transform them into a simple and convenient dinner that my whole family would devour! Make sure you scroll all the way to the end of this post too, because I posted a helpful video on how to make this One Pot Cheesy Pesto Tortellini! 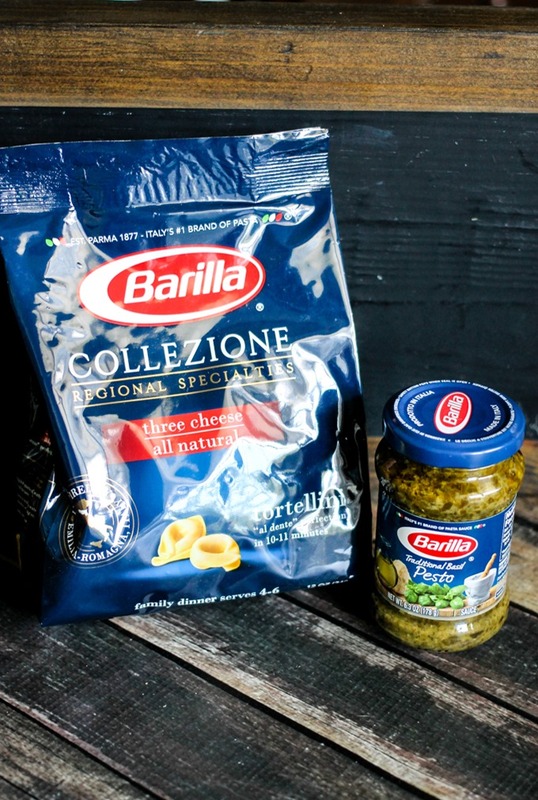 I picked up a 2 pack of Barilla Collezione Tortellini, and then I also grabbed a 2 pack of Barilla Traditional Pesto Sauce! I knew right away that I could whip up a delicious one pot meal with these delicious ingredients. The pesto adds a very fresh take to the recipe, and then by adding some fresh tomatoes, it made some amazing flavor. Barilla’s Traditional Pesto is made with only the highest quality ingredients like sweet basil, aromatic herbs, and extra virgin olive oil, which makes me feel good about feeding it to my family! Making this a ‘one pot’ meal, means that you only need to dirty one pot which is a total win in my book. The less dishes, the better. You just bring the liquid to a boil, add the tortellini, and then simmer for about 10 minutes. 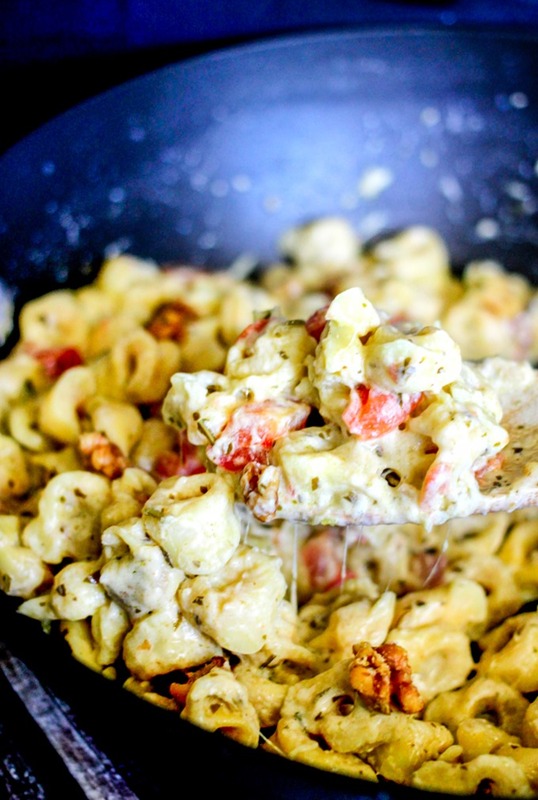 After that you add the pesto and cheese and voila – One Pot Cheesy Pesto Tortellini dinner is served! 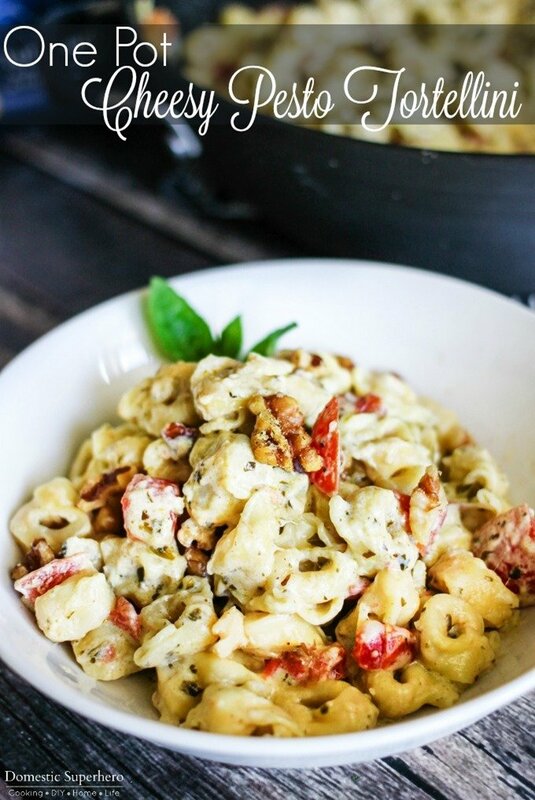 The pesto, Parmesan cheese, tomatoes, and walnuts add such a delightful flavor combination to the all-natural cheese tortellini which is crafted with the highest quality ingredients. This meal is so easy to make, comes together in 20 minutes, and your family will be begging for seconds! 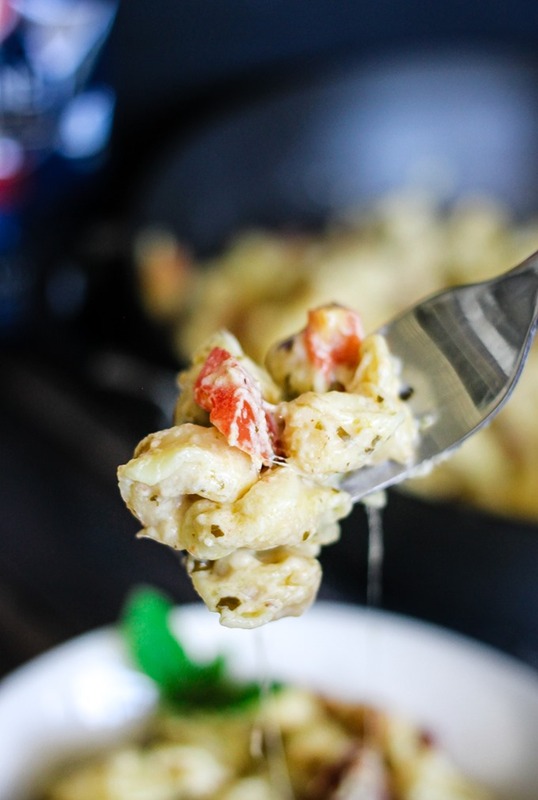 One Pot Cheesy Pesto Tortellini is the easiest and tastiest weeknight meal - tender tortellini and tomatoes drenched in a creamy cheesy pesto sauce! In a high sides skillet or pot, add butter and garlic, sauté for a minute. Add chopped tomato, sauté for 30 seconds. Add heavy cream, water, and tortellini; cover and bring to a boil. Reduce heat and simmer for 10 minutes or until tortellini is cooked through. Add pesto and mix into pasta, then add cheese, mixing in until melted. Serve and top with a few walnuts as garnish. I also made a video to demonstrate just how easy this One Pot Cheesy Pesto Tortellini is! You can check it out below! So EASY and looks delicious. This looks wonderful!! How many people does this serve? I would say 4-5 depending on how much you eat!